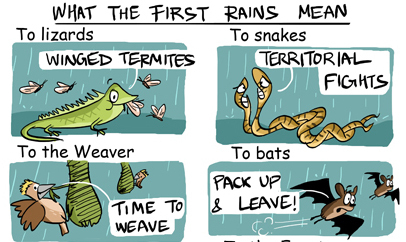 Master cartoonist, keen observer of nature, and wry observer of birdwatchers, Rohan Chakravarty has drawn a cartoon-poem on the meaning of the first monsoon rains. The image here is only a snippet. Follow the link and scroll down to see why we at MigrantWatch particularly love this cartoon. PS. Rohan’s Green Humour blog is full of wonderful cartoons and trenchant observations — do take a look! As regular MigrantWatchers know, we run a Pied Cuckoo Campaign every year, from May to August. The idea behind this campaign is to better understand the timing of migration of the species, as it wafts across the Arabian Sea from east Africa to land on our soon-to-be-green land. More specifically, this applies to the population of Pied Cuckoos that migrates to central and northern India; in southern India, the species can be seen year-round (as you can see from these nice eBird maps on the Bird Count India website). Over the years (the campaign started in 2009), your sightings of Pied Cuckoo have enabled a better understanding of its migration in relation to the onset of the monsoon. You can see some summaries of the information collected on various MigrantWatch blog posts, including an analysis of the very first campaign, a comparison between 2009 and 2010, and animated map of Pied Cuckoo sightings, and a summary of four years of arrivals in relation to the monsoon. Please do be on the looking for the species, and remember that you can contribute your observations to either MigrantWatch or eBird. In the Pied Cuckoo campaign, MigrantWatchers have contributed 363 sightings of this wonderful species so far (until 15 July 2011). A summary of these sightings from places to where the Pied Cuckoo migrates shows that it does, by-and-large, arrive in advance of the monsoon, but the exact dates are variable. To illustrate the general pattern of migration of this species, we have put together this animated map, which shows the progression of Pied Cuckoo migration across the country in advance of the monsoon. This animation has been made by selecting March-to-July sightings from all Pied Cuckoo reports in the MigrantWatch database between 1 July 2007 and 15 July 2011. To compare these sightings with the onset of the monsoon, we have also added in lines depicting the normal onset of the monsoon (digitised from a map available from IMD Pune). In March and April, almost all sightings are from southern India, where the species is known to be resident year-round. This remains so until the middle of May. In the third week of May, the first migrant sightings appear, in the West and the North-east. As the monsoon hits the Andamans, the first birds in northern India are seen. More and more birds are subsequently seen across the West, North and East. By the time the monsoon reaches Kerala (in the first week of June), Pied Cuckoos are everywhere, except perhaps the extreme West and North-West. Where are the gaps in information? Do you see patterns that would be interesting to follow up? Do leave a comment below. Thanks, of course, to all MigrantWatchers who have contributed their Pied Cuckoo sightings! Mousumi Dutta is a frequent contributor to the MigrantWatch database. She is an avid birder, and spends her spare time on bird and wildlife conservation. She works with the Indian Meteorological Department, and so has a particular interest in bird migration. Mousumi’s MigrantWatch sightings page is here. India’s climate is dominated by monsoons. Most of its annual rainfall (86%) occurs during the Southwest monsoon months. The monsoon is a key influence on agricultural output as well as the overall economic growth of India. From ancient times it has been believed that the onset of the monsoon is associated with the appearance of the Pied Cuckoo Clamator jacobinus. The Southwest monsoon normally sets in over Southeast Bay of Bengal on 20 May and then over Kerala on 1 June. 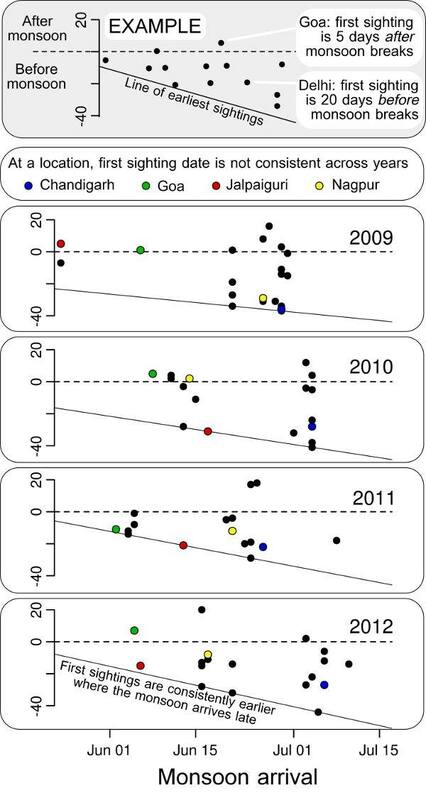 An analysis of the first sighting dates of the Pied Cuckoo and the onset of the Southwest monsoon for the year 2010 (see figure below) shows a fairly systematic pattern. In general, the first sighting of this species in a State is 20-25 days in advance of the onset of the monsoon in that State. This appears to be earlier, relative to the monsoon, than reported for last year. These patterns indicate an interesting relation between the onset of the monsoon and the arrival of Pied Cuckoos. Long term studies are needed to clarify the details of the relationship between the monsoon winds and Pied Cuckoo migration. First sighting dates (after January 2010) for Pied Cuckoos for each State were taken from the MigrantWatch database. (Maharashtra and the four southern States were excluded.) Dates of the onset of the monsoon for each State are taken from the Indian Meteorological Department’s monsoon pages (click on “Northern Limits of Monsoon”). The data used to generate the figure are given below. The links under “Reported by” point to the sighting page on MigrantWatch. If you would like to make your own visualisation and analysis of Pied Cuckoo sightings, you can download all 300+ records here. Please share your findings with everyone at MigrantWatch – send us (mw@migrantwatch.in) a small blog post and we will put it up. In popular folklore the appearance of certain birds is considered to herald the approaching rains. But there are other, less conspicuous, organisms whose arrival often goes unnoticed. Migratory insects of several species arrive in the thousands, either alone or in swarms, staggered across the days preceding the arrival of the rains. In a recent paper that generated headlines worldwide, Globe Skimmer dragonflies Pantala flavescens (also called Wandering Gliders) were discovered to have the longest insect migration route recorded so far – a roundtrip flight between India and Africa with stopovers in the Maldives and the Seychelle islands. Charles Anderson, reporting his findings in the Journal of Tropical Ecology <1>, recorded the arrival and departure of dragonflies in southern India, Maldives and West Africa over a period of fourteen years, with Malé, Maldives being the focal site. Dragonfly occurrence (particularly P. flavescens) in Malé began in October, peaking between November and December, coinciding with the east-bound high-altitude winds (~ 1000 m asl) of the Inter-Tropical Convergence Zone (ITCZ <2>). Putting together dates of arrival across the study sites as well as the duration of residency of dragonflies at Malé, he reconstructs a steady north-south movement of dragonflies from southern India through the Maldives across 500-1000 km. A second wave of dragonflies was recorded in Malé between April and June, coinciding with occurrence of the Somali Jet, a band of fast low-lying southwesterly winds over the Arabian Sea blowing from Africa to India. While this study was focused on dragonflies, Anderson also reports some information on birds, and found that the pattern of bird arrival in the Maldives mirrored that of the dragonflies, peaking between November and December. Among the bird species he reports as crossing the Western Indian Ocean are the Pied Cuckoo, Lesser Cuckoo, Eurasian Cuckoo and the Amur Falcon. Collating available information on the migration of birds like the Amur Falcon, wind patterns like the ITCZ and Somali Jet, and records of occurrence of certain species of dragonflies at specific times of the year in the Maldives and India, Anderson hypothesizes that dragonflies, like some species of birds, possibly migrate in a loop from India over the Maldives and Seychelles to east Africa (Tanzania or Kenya) and then back again to India. The ITCZ is known to travel across the African continent, bringing rains to different parts of Africa over the year <3>, and insect, including dragonflies, are reported to migrate with these winds. Anderson suggests that, once in Africa, Globe Skimmers probably move southwards and then loop back north to equatorial east Africa before leaving the continent on the return migration to India. In all, this incredible circuit would cover a total distance of 14,000-18,000 km, with 3,500 km over the open ocean, and would span possibly four generations of dragonflies. How could insects only a few inches long undertake journeys that span their own body lengths several million times over? On the face of it, this implies deterministic and purposeful flying, as well as knowledge of which winds to harness to get to a destination. Anderson proposes instead that dragonflies need only rise upwards, encounter a passing wind and then largely soar or glide along this wind till they reach land. If this simple explanation is indeed the way in which dragonflies cover these enormous distances, how will such behaviour be affected by phenomena like global warming, which is known to alter the intensity and speeds of winds like the Somali Jet <4> and the ITCZ? Dragonflies are reputed to be powerful fliers, and several species migrate long distances <5>. The Globe Skimmer is considered to be the most widespread dragonfly, occurring between the 40th parallels of latitude worldwide, and it is common across India <6>. Several populations of this species are known to migrate, and there are recorded migrations of Globe Skimmers from South America to Easter Island (possibly 3,600 km or more), to New Zealand (2,000 km), across the Chinese Bohai sea (nocturnal migrations) and over the Hindu Kush mountains (at altitudes of 6,500m asl). Within the Indian subcontinent, the Globe Skimmer arrives in Tamil Nadu after the North-East Monsoon, while in the western regions it arrives with the South-West monsoon, implying that there might be more than one migratory circuit even within this region. While dragonflies and insects remain challenging to track over long distances, a number of studies have used arrival date information, mark-recapture techniques, and even radio-telemetry <7> to determine their migratory patterns. But, given the epic scale of the migration uncovered by Anderson, perhaps it would make sense to simultaneously examine both more visible taxa like birds and more populous taxa like insects. Doing so might provide a more comprehensive account of migratory patterns, mechanisms, and the evolutionary reasons for these spectacular journeys. 1. Anderson, R.C. 2009. Do dragonflies migrate across the western Indian Ocean? Journal of Tropical Ecology 25(4): 347-348. Download pdf. 2. The ITCZ is a weather system around the equator where the North-East and South-West trade winds converge. More information. 4. Meijing, L., Ke, F. and Huijun, W. 2008. Somali Jet Changes under the Global Warming. Acta Meterologica Sinica. 22 (4): 502-510. Download pdf. 5. Corbet, P. S. 1999. Dragonflies: Behavior and Ecology of Odonata. Cornell University Press, Ithaca. 6. Subramanian, K.A. 2005. Dragonflies and damselflies of peninsular India. A field guide. Edition 1.0. E-book of Project Lifescape, Centre for Ecological Sciences, Indian Institute of Science and Indian Academy of Sciences, Bangalore, India. 118 pages. Copyright K.A.Subramanian, 2005. Download pdf. 7. Wikelski, M., Moskowitz, D., Adelman, J.A., Cochran, J., Wilcove, D.S. and May. M.L. 2006. Simple rules guide dragonfly migration. Biology Letters, 2: 325-329. (Wikelski and colleagues radio-tagged 14 dragonflies in North America and followed them for 12 days with Cessna planes and ground teams.) Download pdf. The early arrival of the monsoon and a possible link with Pied Cuckoo arrivals is the subject of a short article by Max Martin writing in the Mail Today on Saturday, 6 June. (Please note that the photo was taken by Clement Francis.) A shortened version also appeared in The Hindu News Update Service on the same day. We’d like to clarify that the earliest first sighting date for migrant Pied Cuckoos this year was not from the Biligiriranga Hills in Karnataka (which is what the article says), but rather from Kolkata on 17th May by Kshounish Sankar Ray. Chandigarh, 23 May (Vikram Jit Singh); Bangalore, 24 May (Suma Rao); 26 May, Bhubaneswar (Aditya C Panda); 26 May, Dehra Dun (Suniti Bhushan Datta); 28 May, Nagpur (Soham Mehta); 29 May, Jalpaiguri (Mousumi Dutta); 2 June, Pune (Anirudh Chaoji); 7 June, Goa (Fionna Prins). All these sightings were reported to MigrantWatch and can be seen on the Pied Cuckoo Campaign page after you log in. (you can also see records from previous years, all the way back to 1910). In addition to these sightings, Sunjoy Monga saw a Pied Cuckoo at Mumbai on 1 June, Mumbai (sent to birdsof bombay); Arunachalam Kumar reported seeing a Pied Cuckoo on 10 May in Mangalore (sent to bngbirds), but it isn’t clear whether the species is migrant or resident in this area. For those of you who are tracking the progress of the monsoon rains, the Indian Meteorological Department, Mumbai has a very useful map indicating the dates of normal onset of the monsoon (there is also a more detailed map on wikipedia). The map for this year’s onset of the monsoon (from IMD, Pune) shows how much earlier the rains have arrived in 2009.